We thought it high time we checked out the bar and restaurant that everyone in the Toon is talking about to see if it lived up to the hype. 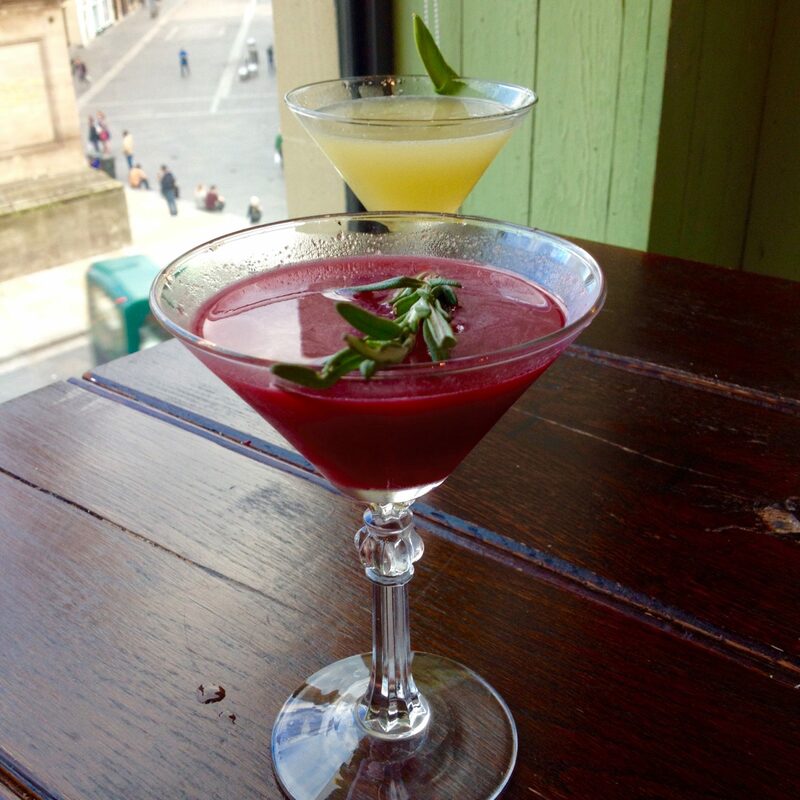 With a name like ‘The Botanist‘ we were looking forward to lots of fresh herbs and other plant-based ingredients. My friend SK and I turned up for dinner on a Tuesday evening in August and the place was positively buzzing, despite not participating in NE1 Restaurant Week. Relieved we’d booked ahead we were swiftly escorted to a table overlooking Grey’s Monument. 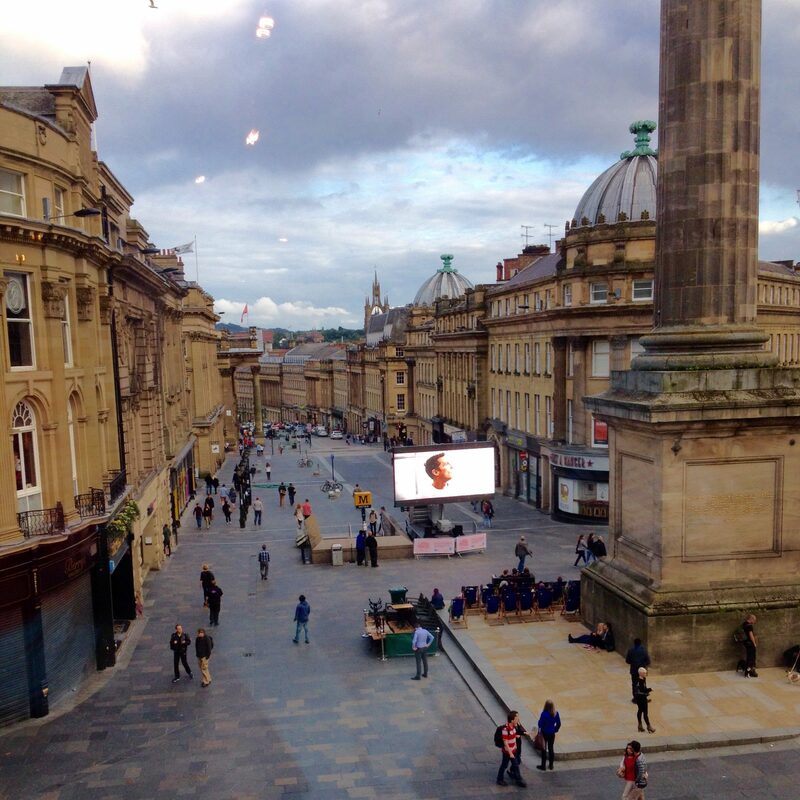 “You can catch the end of Interstellar” the friendly hostess commented pointing to the outdoor screen, as we took in the fantastic view of Newcastle’s skyline. As SK and I were having a much deserved girls night out it would’ve been rude to ignore the bulging menu of ‘botanical cocktails.’ After much deliberation I plumped for a cherry blossom martini and SK a sugar snap and mint martini (both £6.95). The live music that The Botanist famously puts on every night started in the bar area as we waited for our drinks to arrive, and we turned our conversation volume up a notch. This is the place to see and be seen sipping cocktails and admiring the view. It certainly has a lovely atmosphere if perhaps not the place for a quiet meal! 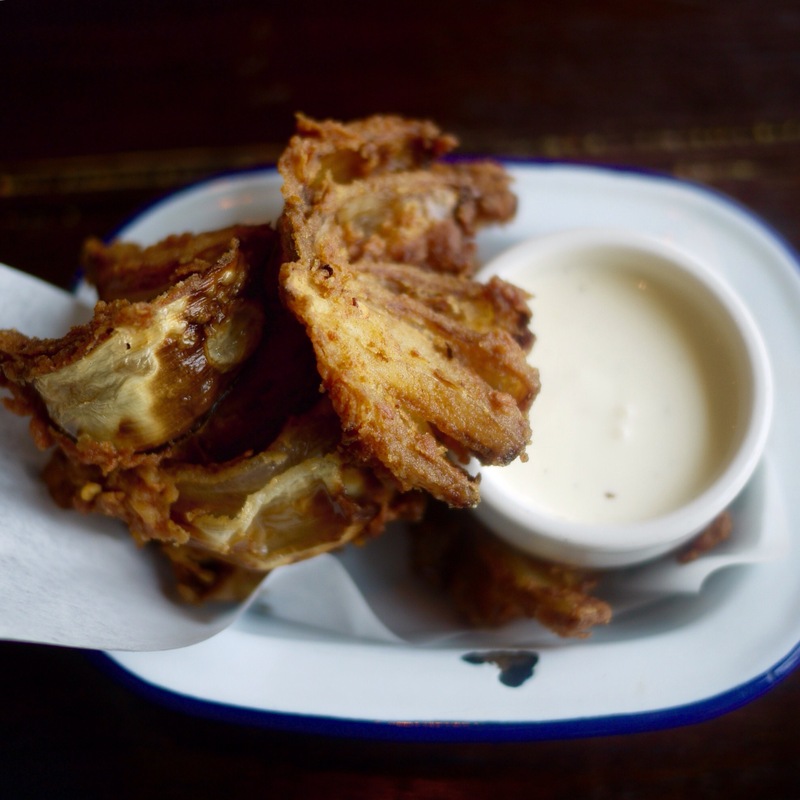 We checked out the menu, which has a sociable, sharing feel to it – deli boards full of charcuterie, cheese and antipasti, baked Camembert, chicken wings, as well as the more substantial pub grub favourites like fish and chips, steaks and barbequed meats. 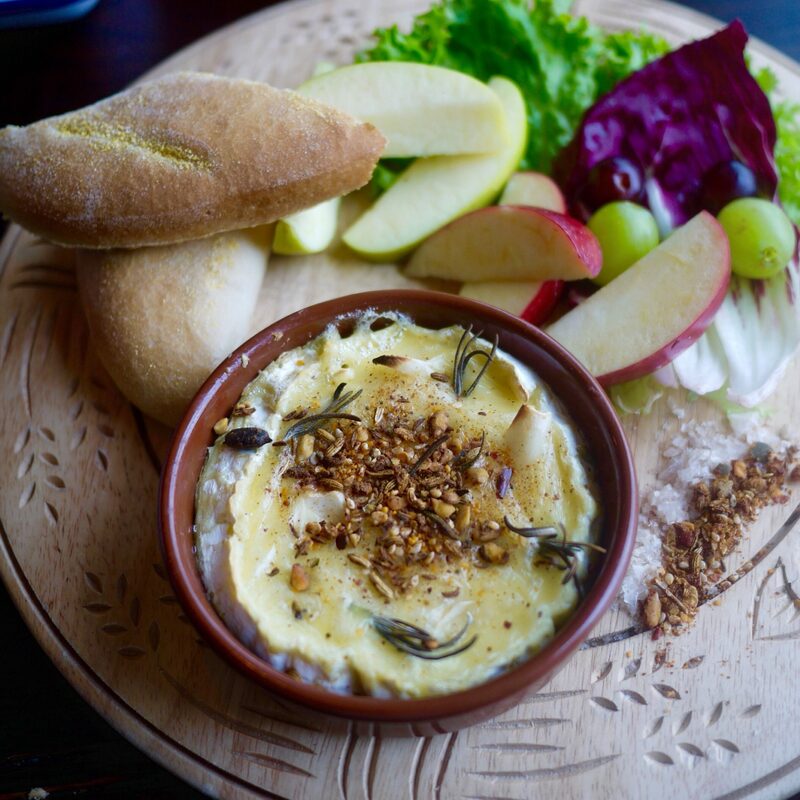 We settled on two starters which we decided to share – the Camembert which came with flatbread and fruit (£6.75) and salt and pepper onion petals (£3.50), which I’ve never seen on a menu before and sounded like something we needed to try. We soon polished off our martinis, which were delicious – mine came with a very botanical Rosemary sprig in it and was delightfully refreshing, with elderflower, cherry and lime flavours. SK was very enamoured with her sweet pea and mint martini which was flavoured with the very herby Benedictine liquer, as well as apple and mint. Our lovely waitress Laura – quite possibly the sweetest and most genuine person I’ve met in quite some time, arrived with our starters as we were deciding which cocktails to have next. We dropped everything to drool over the baked Camembert, that stalwart of girly meals out. The cheese was the centrepiece of a rather medieval-looking wooden board filled with bread, apple slices and olives on a bed of lettuce. It was topped with more rosemary sprigs as well as a delightful mix of toasted seeds, herbs and spices as well as some roasted garlic (perhaps give it a miss if you’re on a first date!) We enjoyed dunking various things into the perfectly gooey french cheese. The onion petals were a revelation! Lightly battered, they had a tempura-like consistency, crisp bite and had us scratching or heads as to how they’d chopped the onions and kept the petals intact. The sour cream dip was the only thing that slightly let it down, it was fine but I would’ve liked something with a bit more of a kick – perhaps a blue cheese sauce or a garlic aoli. I guess chef was letting the petals do the talking. 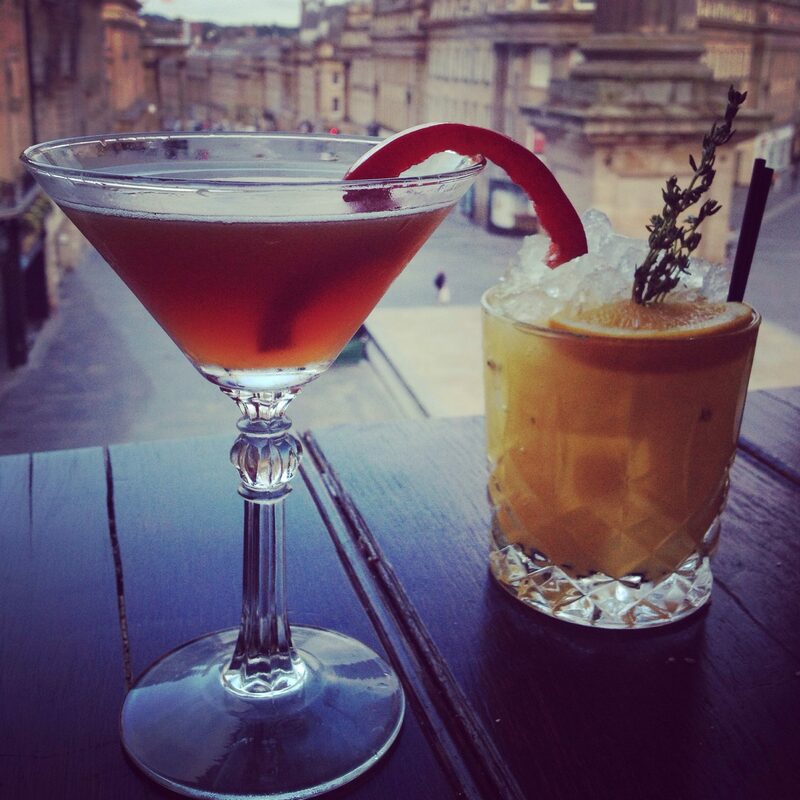 Our next round of cocktails were swiftly ordered – orange and thyme short (£7.50) for SK, and a red pepper and porcini Manhattan for me (£7.95). I was intrigued by the flavours infused into my bourbon-based drink, which added an earthy tone to a very grown up drink – not for the faint hearted! SK happily sipped on her fruity rum based drink while we watched the rain start to come down on the people outside. Between courses I had a quick nosy around the bar area, which centres on the old monument mall domed glass ceiling – hard to believe this used to be a shopping arcade! 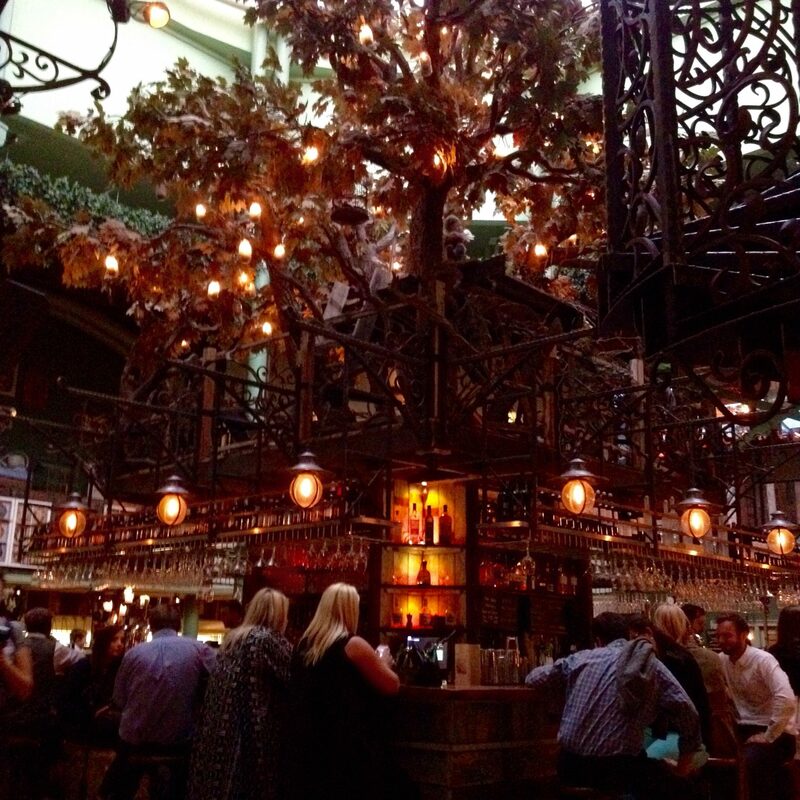 A tree covered in fairy lights and interesting light features adds to the quirky cool vibe that surrounds the bar. I got back in time to see our mains arrive – we both went for the hanging kebabs this place is well known for (they even have a TM next to them in the menu! Can you trademark a kebab?!) I went for lamb kofta (£11.50) and was happy that I could pick how I wanted it done. It arrived pink in the middle and tender. SK went for the chicken kebab (£10.50), and both were ‘sopped with sweet chilli, ginger and garlic butter’ according to the menu. My lamb came with piri piri sauce, and SK’s came with garlic butter – flying in the face of that popular chicken chain that likes to throw piri piri over all its chicken! The spicy sauce added a nice kick to the mildly spiced lamb. SK enjoyed the chicken and said it was perfectly cooked. If it was me I would’ve liked a more punchy sauce with such a plain meat but she was happy, which was the main thing. 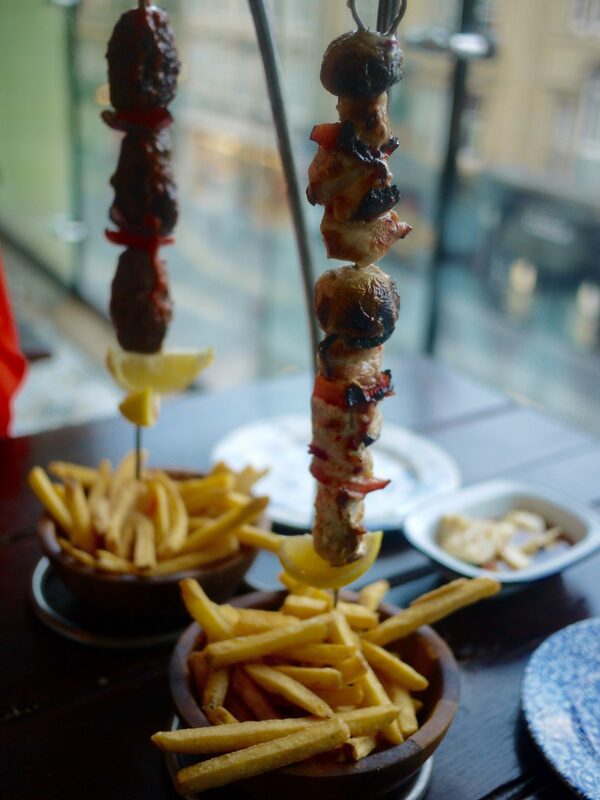 Perhaps one for those who don’t like too much spice and want a BBQ style skewer of chicken, mushrooms and peppers. The unexpected delight though was the side of haloumi which Laura had recommended we try – it came in a chilli honey sauce and really complimented the lamb. The ‘perfectly seasoned chips’ that accompanied our kebabs were good although they could’ve perhaps been a little hotter. Wanting to try some of the delicious sounding desserts but conscious of time and with a film to catch, we ordered them as our mains were being cleared mentioning that we were in a little bit of a rush. Five minutes later they arrived, great service! SK is partial to a rum baba (£4.95) and she was delighted to see that this was on the menu. 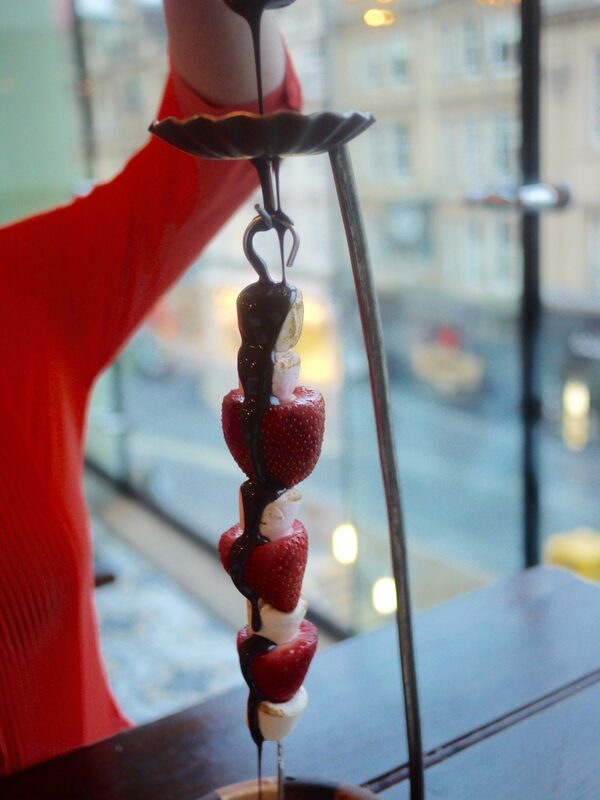 I wanted something light and summery, so opted for another hanging kebab, this time the strawberry and toasted marshmallow option which came with vanilla ice cream and sailor jerry rum-infused chocolate sauce (£4.95). The rum soaked desserts got the thumbs up, SK commenting that the baba was better than the very good one she normally has at Bradley Gardens. My skewer brought back memories of summer barbeques as a child and pouring chocolate sauce over it was fun. Chef was perhaps a tiny bit heavy handed with the rum for my liking (but you can have it without too). Saying our goodbyes to Laura, we were tempted to take her to the cinema with us! It’s such a delight to be served by staff who love their jobs like Laura quite clear does. 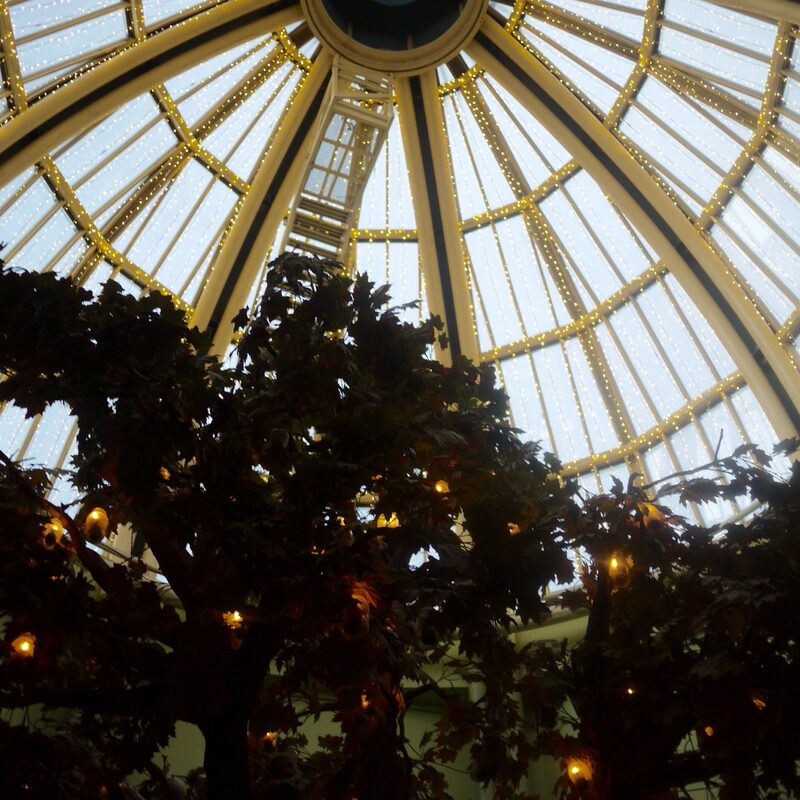 We had a very enjoyable evening at The Botanist. It is a well-oiled machine, with a very good grasp of what it takes to make a night out or lunch with friends ‘work’. Next time we’ll check out the roof terrace, weather permitting! This latest in six Botanists has certainly invested in its staff recruitment and training and it shows. 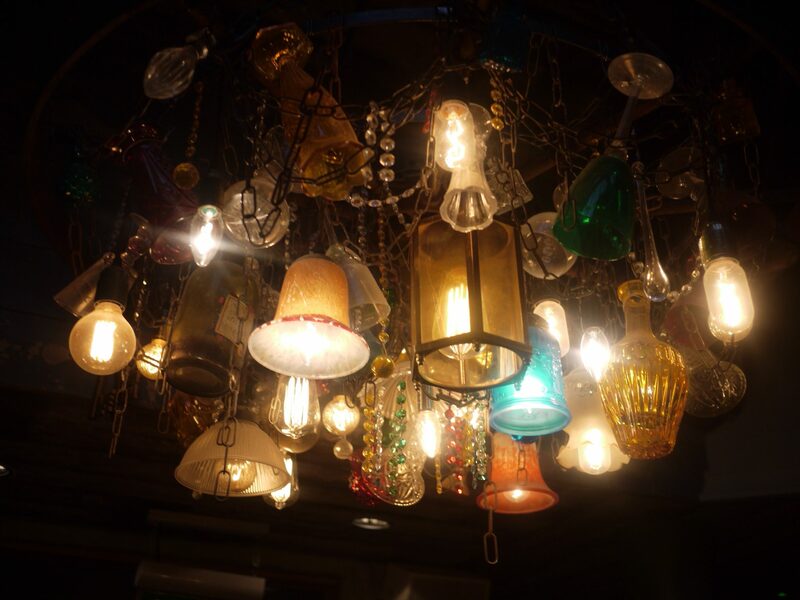 It’s the place to go for sociable, decent food and well made cocktails to a background of live music. No wonder it’s so popular. SK and I were provided with a complimentary meal for the purposes of this review. However the opinions expressed in this article are honest and true to experience.